High blood pressure is not all that uncommon among elderly adults. In fact, two out of three adults over the age of 75 will be affected by blood pressure problems. Because of this staggering number, these elders are being prescribed medications to maintain a healthy blood pressure level. Medication is usually not enough to keep the blood pressure levels at a normal rate. Making healthy changes to one’s diet and/or lifestyle are also important components to a healthy body. With the help of a home health care provider, there are a number of healthy choices that can be made to help your elderly loved one live a long life. Eat plenty of potassium. Some medications, such as diuretics, cause the body to lose a large amount of water and sodium. Potassium in the body may also be excreted. This mineral is an important one for a healthy blood pressure, so eating food that is rich in potassium or taking a supplement will give the body back the mineral that the medication has removed. Take vitamin D or calcium supplements. Calcium channel blockers are sometimes used to prevent calcium from making its way into the muscles of the heart and arteries. This medication is supposed to reduce hypertension and lower the heart rate. Calcium and vitamin D are both important components in order to keep the bones healthy, so encourage the elder to take both supplements for strong bones. Identify reason for being tired. Along with high blood pressure comes feelings of exhaustion and fatigue. Although it is a common side effect of this condition, there are other reasons your loved one may be excessively tired. It could be caused by being overweight, being stressed, depression, or not eating a healthy diet. 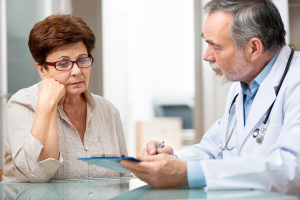 Have the senior talk to their doctor about possible reasons for their exhaustion. Talk to a pharmacist or doctor. When prescription medications are combined with over-the-counter supplements, it could cause a number of side effects. Before your elderly parent decides to take a new vitamin or supplement, talk to the doctor or pharmacist to make sure it will not cause an adverse side effect on their body. Take the medication at the same time every day. Side effects can also happen if the medication is not taken at the same time or at the right dosage amount. Your elderly loved one needs to make sure they read the instructions and take the medication only as it is prescribed. High blood pressure is a common condition among seniors, but can be managed. These tips should help your loved one keep their blood pressure at a healthy level. For Home Health Care Services in Cordova TN, please contact the caring staff at Personal Care Services MidSouth today! This entry was posted in Home Health Care Cordova TN and tagged Home Health Care Cordova TN. Bookmark the permalink.